UPDATE: Microsoft has confirmed the page was in fact posted in error and has no plan to allow users to pre-load Titanfall at this time. The page displaying this information has now been removed. 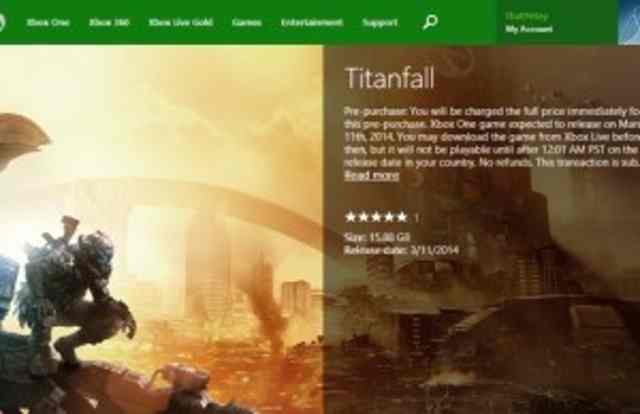 The Official Xbox website has been updated to show details of the ability to pre-purchase and pre-load Titanfall ahead of it’s release. According to the information on the Xbox website, you may download the game from Xbox Live as soon as your pre-purchase is placed, but it will not be playable until after 12:01 AM on the release date in your country. The website suggests the download size will be 15.88GB, but we’re still unsure on whether this is just the pre-load installation size to start the game whilst the rest is installed, or the full size of the Titanfall installation. We’re assuming the sudden functionality is included in the upcoming Xbox One system update, which supposedly “prepares” the console for Titanfall. No price information has yet been displayed and you cannot make a purchase at this time. You can see all here.